The cool, windy LA weather made for a weekend that almost felt like fall back home. 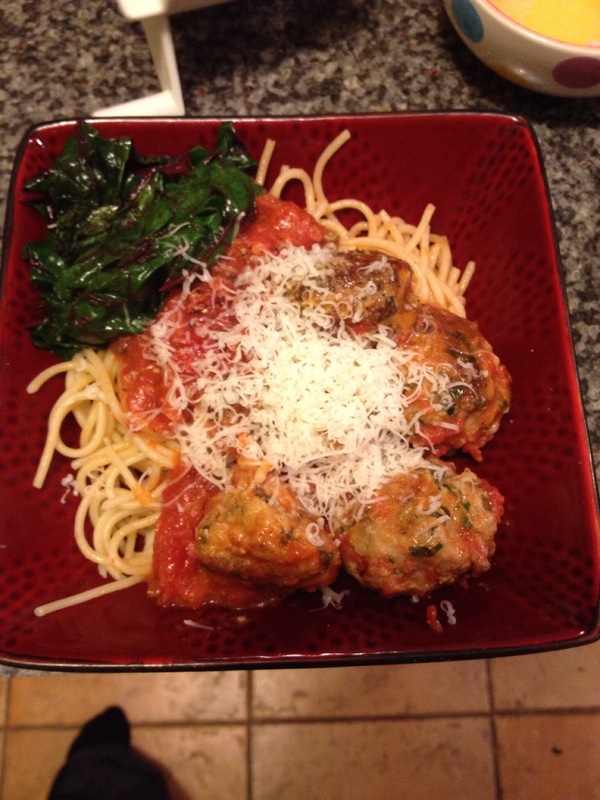 Halloween night I made spaghetti and meatballs the tradition of my grandmother. I was a vegetarian for fifteen years, vegan for some of that, but I’ve been enjoying eating farm-raised meat for the last few years. Most of the time I eat vegan meatballs, either frozen or homemade, but these real meatballs, with parsley and freshly grated Parmesan, were really incredible. 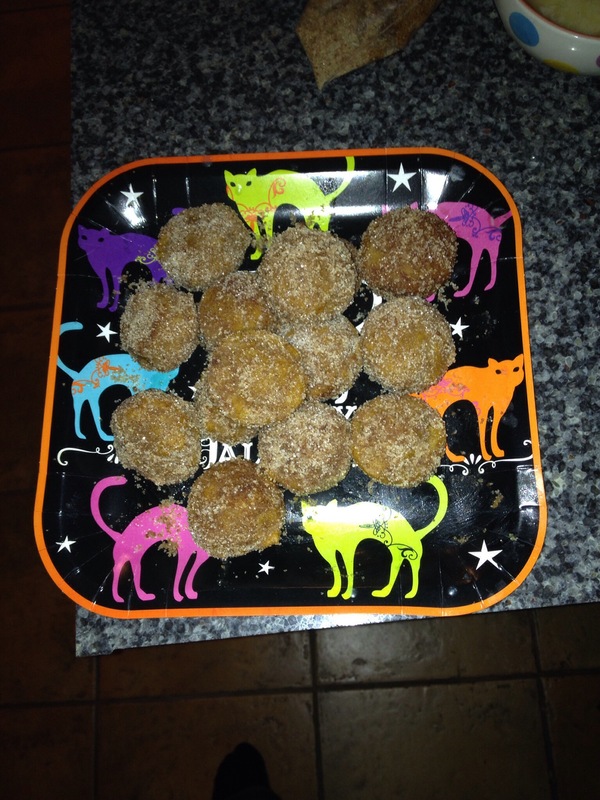 The GF pumpkin spice donut holes also came out really well. They’re baked in mini muffin tins. They taste fried because they’re dipped in melted butter and covered in cinnamon and sugar. Seriously, so good. On Saturday we headed downtown and did some community service. J was presenting at a career fair at the Inner City Arts school in downtown LA. Such a cool program. I hung out and folded origami while listening to J and her coworker talk to high school kids about becoming an architect. I was cramping a LOT. Constantly, all day, as if I had my period. Last time I felt tiny sharp pains in one specific spot. Yesterday I did feel some of this, but mostly it was all over cramps for 36 hours straight. I was excited. I also noticed two distinct symptoms – my breasts were starting to get sore, and we’re progressively more sore throughout the weekend, and I started to feel breathless. Being breathless was my most prominent symptom when I was last pregnant; I would be short of breath just walking around the house. Last night we went to see Gone Girl. I don’t like to ruin movies for people by going on and on about how great they are and raising expectations, but I’m telling you, this movie is great. I read the book when it first came out and loved it, but the trailer looked boring so I thought I’d be disappointed. For one, the trailer didn’t give too much away. Gillian Flynn has written two other books, Dark Places and Sharp Objects. If you liked Gone Girl, I highly recommend the other two. They’re a little more horror than GG, in fact GG is the mildest. It’s a psychological thriller but also just a drama. J, on the other hand, insists it’s the scariest movie she’s ever seen due to the well-played mind fucks featured througout, how husband and wife play each other ruthlessly. I could write an entire post just about this movie, but I won’t because I don’t want to ruin it for anyone. If you like psych thrillers, just read these books and see the movies (I think Dark Places is also being turned into a movie). After the movie we went to the bookstore and I bought two wedding magazines, then went to La Boulange and split a grass-fed burger, greens, and pickles. I had a natural creme soda and J had a glass of wine. 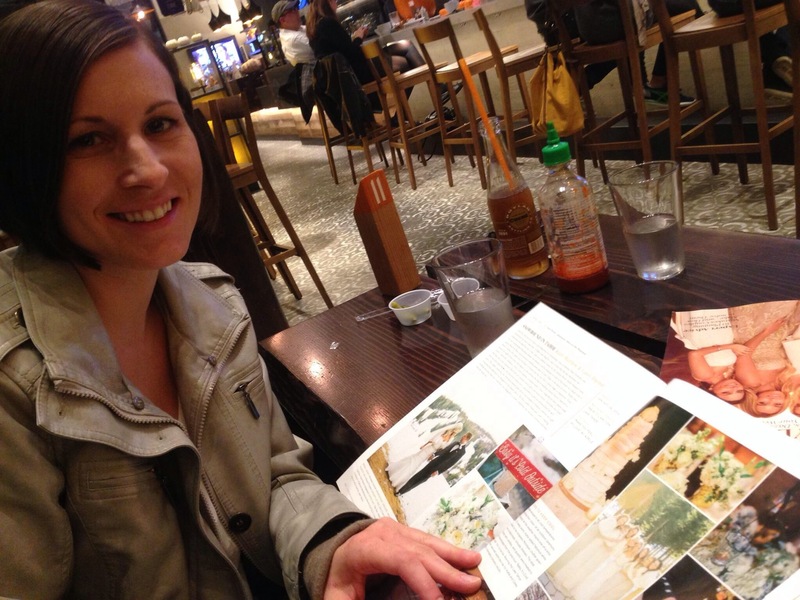 We looked through the wedding magazines and talked about venues. We’ve been so busy lately and it was nice having a weekend to ourselves. I love daylight savings! 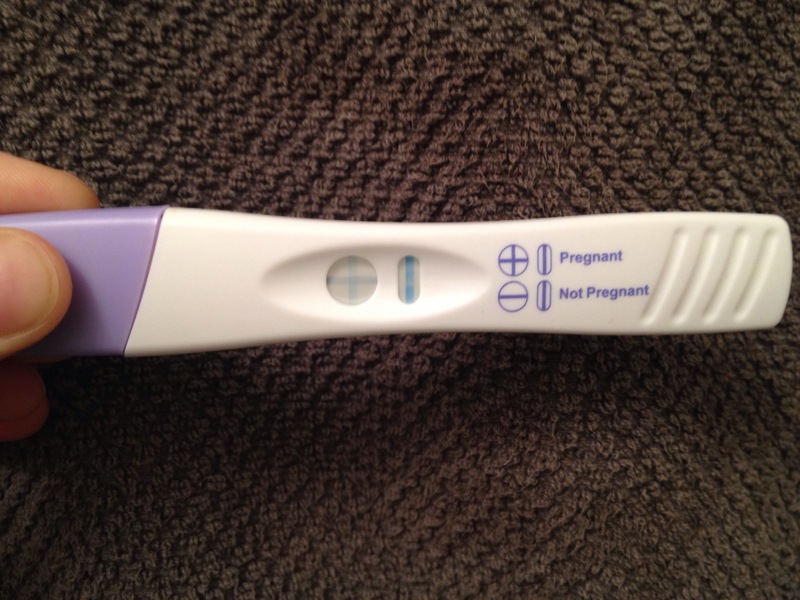 We had a discussion about when to test again last night (I’m going to gloss over it but it ended in a bit of an argument because I was so emotional and defensive, trying to plan for a BFN just in case, and J believes you should always assume the best and put forth positive energy). 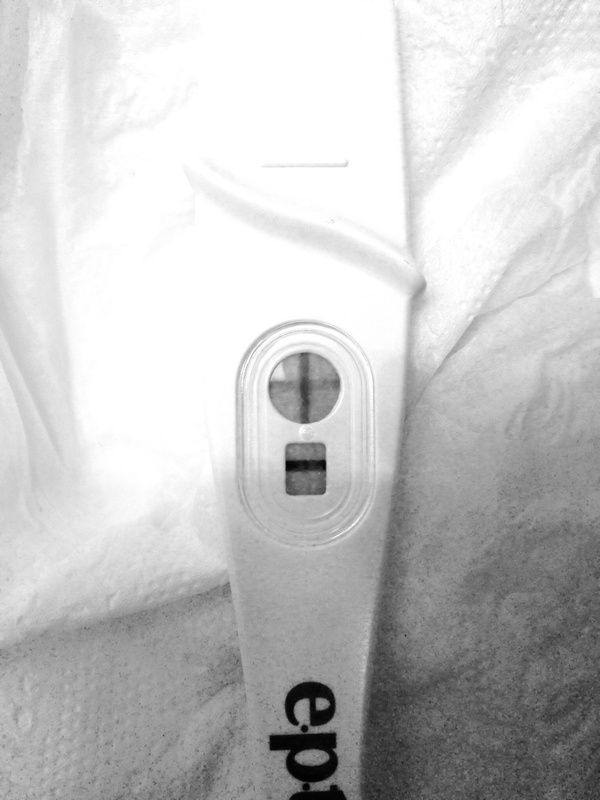 Anyway, we had a good night of sleep and at 5am I woke up and tested the very very faint line I posted this morning. I fell back asleep smiling, not wanting to wake J up, and a couple of hours later surprised her with the photograph. We had a celebratory breakfast of pumpkin pancakes and scrambled eggs with veggies and cheese. I have a crazy week ahead – tomorrow I drive to Santa Ana in a full suit to testify in court which is very nerve-wracking. Tuesday morning after my first beta I have a training in Twin Towers jail (I work for Jail Services). Then I have three long 11-hour days. I’ve been so nervous about something bad happening during this long week, but I’m also so excited and hopeful that my Hcg will continue to climb and I’ll be successfully pregnant! I hope the line gets darker. I want this so badly. We’ve been talking to the embies, continuing to ask them to stay put and stay healthy. For those of you in So Cal, I hope you’re enjoying this cozy fall weather! 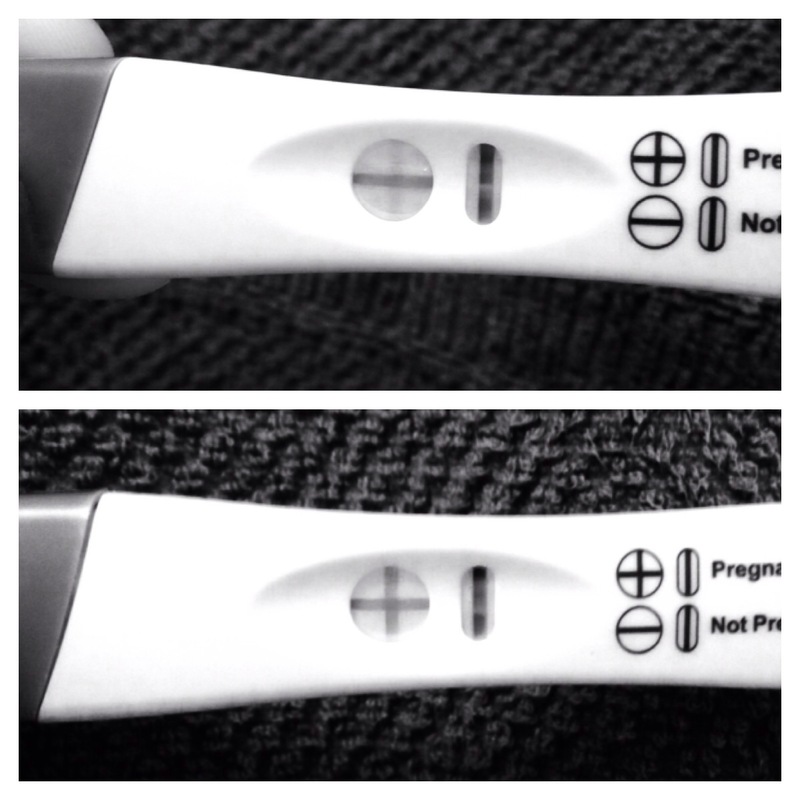 5dp5dt, very early and very faint. The above tests were from Sunday, Monday and today. I have no patience so yesterday, after analyzing the very faint extra line and changing the photo filters over and over to make it show up, I finally just took a digital one. I love how it spells it out! This morning was my first beta. The blood draw nurse at our clinic is awesome. I told her about the digital test and she said it can’t lie! Then I waited allllll dayyyyyyy and finalllllllly got a call from our IVF coordinator at 4pm. Despite the positive HPT, I wanted to know my levels are good before getting excited! Hcg level is 63, and this week I’ll be four weeks. Wait a minute, four weeks?! How is that possible? J’s retrieval was only two weeks ago! I guess it’s calculated differently for IVF? This is crazy. Everything happens at once. I haven’t slept well in two days and I get crabby when that happens. I’m trying to finish everything at work as Friday is my last day, but it’s hard to concentrate with a little nugget inside of me! My grandfather, who is 90, was rushed to the hospital this morning with an infection. He has dementia. When I called him in his hospital room he knew who I was but asked over and over when I’m going to come home from my “trip.” I’ve lived in California for ten years but he waits for me to come home. I cried in my office when we hung up. I had 4am insomnia, nervous for the test. When I finally fell asleep I dreamt that J and I were babysitting my niece and I left her alone while changing her diaper. When I realized my mistake I ran across a town to get back to her and ran up the stairs to get her. I couldn’t tell if she was still alive when I grabbed her in the dream, and then I woke up. I love her so much and all day I’ve felt like a horrible person. I don’t mean to be a downer. 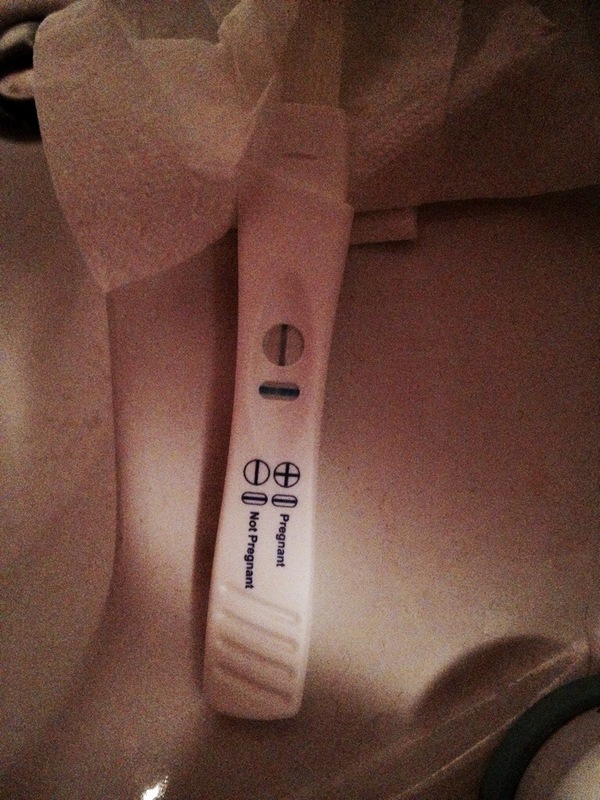 I’m really happy that I’m pregnant obviously. Even though it was our first try, we put nine months of planning and years of savings into it. Literally four months of medications, tests, early morning clinic visits and constant planning went into it. It’s just all happening so fast and I need time to process it! Once this week is over I can’t wait to celebrate! 6DP5DT: Incinta?? = 저 임신했어요?? Am I pregnant?? Is there a tiny Korean-Italian nugget inside me? I tried to wait until my Beta or at least the day before (which is today). But we had 2 tests leftover from when J had to confirm her trigger shot with the clinic and my conception friend was testing yesterday morning so of course I did too. Read on. The day was fraught with mixed anxiety and excitement. I sent the pic to my mom and sis who both saw the very faint second line. J said she saw the line but it was too early and she wasn’t going to add to my crazy-making. 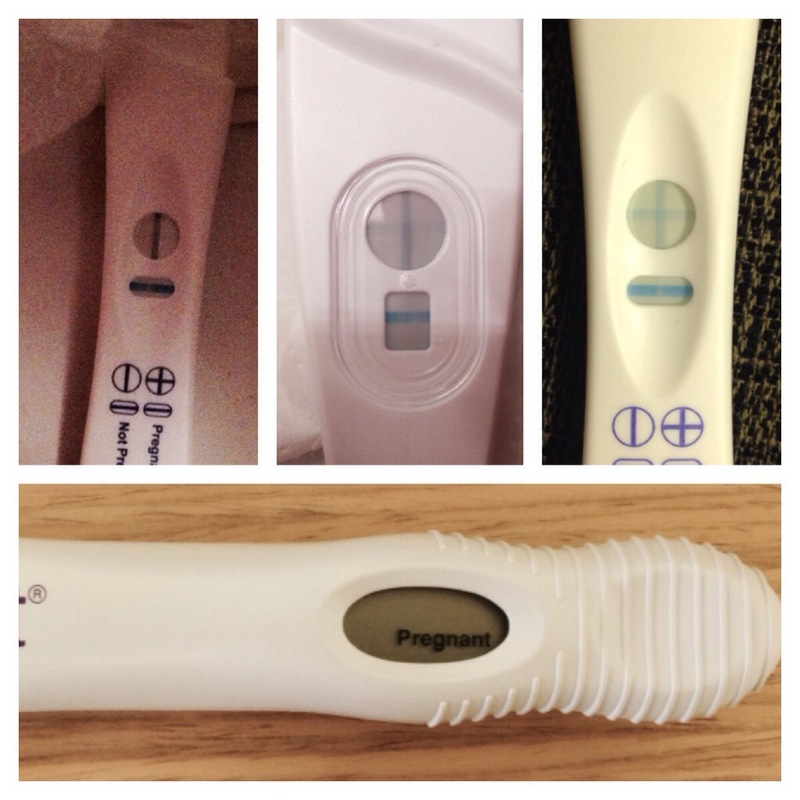 I bought brand-name pregnancy tests and decided to try again. What do you think out there in blog land? 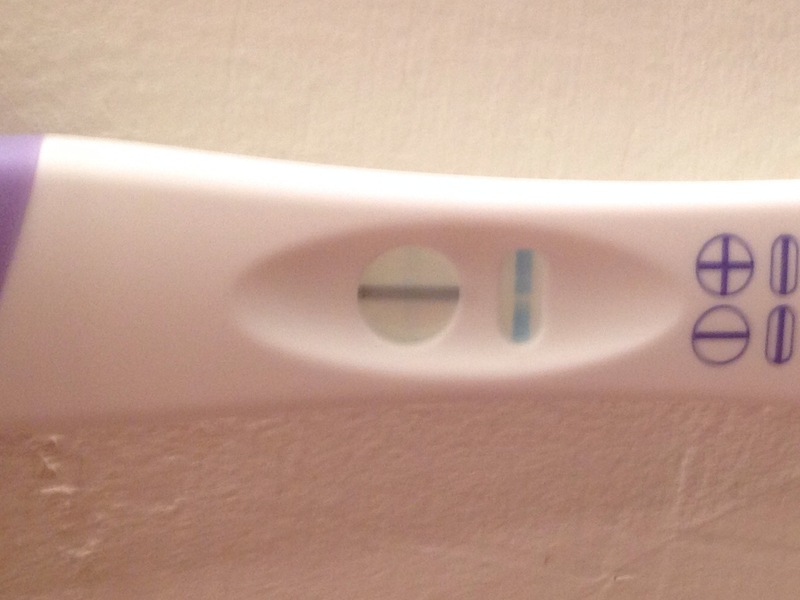 I googled “very faint line on pregnancy test” and the concensus is that a very faint line means positive. 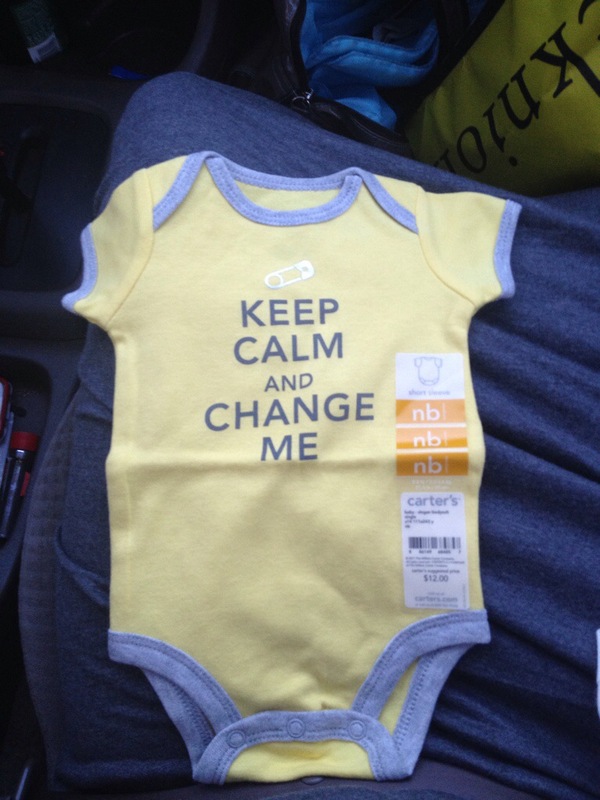 My mother’s a midwife and she agrees. However, I’m very familiar with the risks of getting excited. Even if my Beta tests positive, I’m going to be ready for anything until the next few days, weeks and then months are over. But it’s the Year of the Horse and J’s my good luck charm so here’s hoping! Side note: Last night we went to see Uh Huh Her! Diehard lesbian culture fans out there, you know who I mean. I remember watching the movie All Over Me my first year of college and how adorable Leisha Hailey was. Then I got into The Murmers and listened to “Genius” on repeat for a year. Of course I’ve seen every episode of The L Word once or twice. Because the concert was in West Hollywood, the mecca of L Word-type actresses, Katherine Moennig (the coveted Shane) was in the audience last night! Also I ordered my first non-alcoholic beer ever (I have to have a bottle in my hand at a concert) and it was actually pretty good! Did I get that fertility jargon right? For two days our little blastocysts have been hatching. Maybe they’ll start implanting tomorrow. J was very concerned that we should only have transferred one embryo and worried about twins. 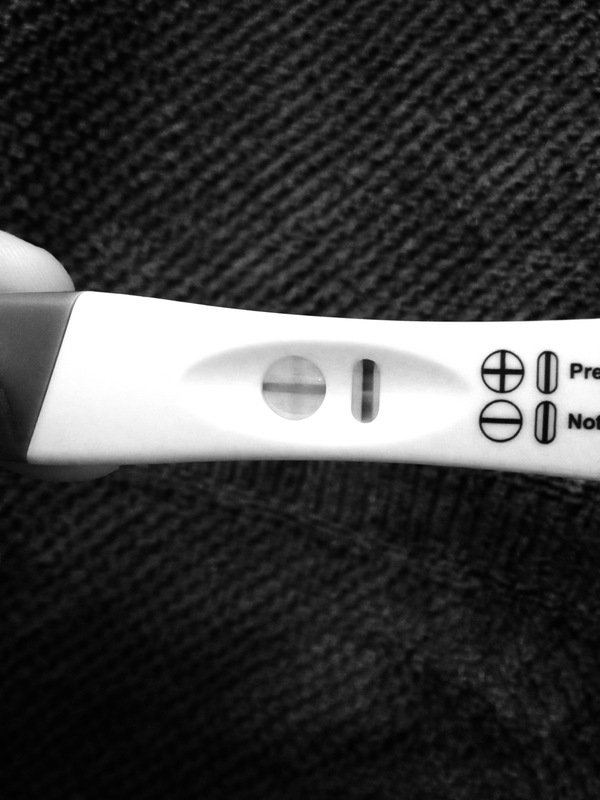 I’m just worried I won’t get pregnant. 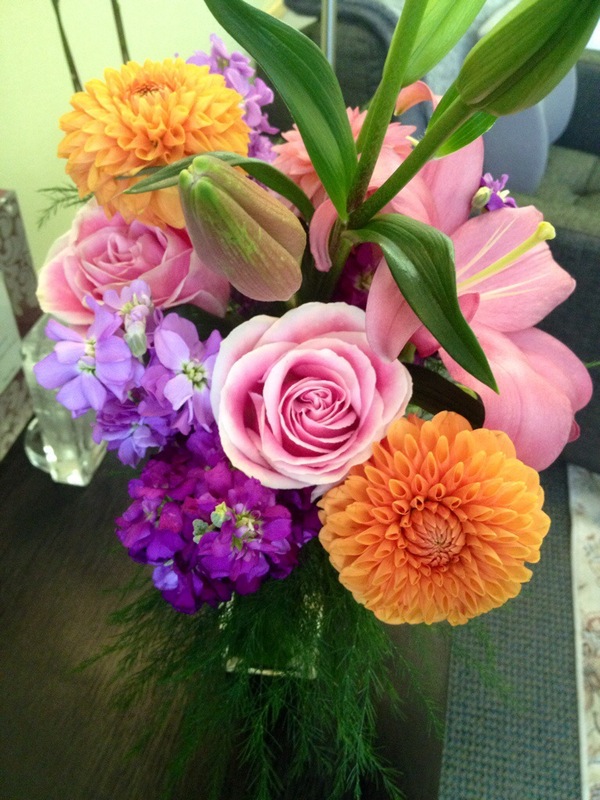 J sent flowers to my office yesterday: for me and for our blasties!